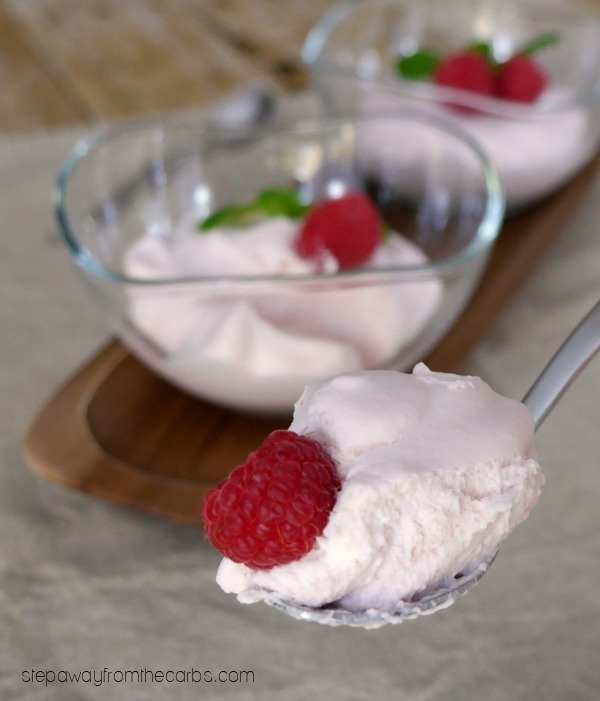 This delicious low carb raspberry mousse is a light, creamy and fruity dessert. 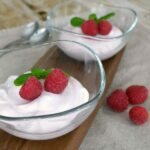 Sugar free, keto, and LCHF recipe. I love making desserts with berries! I’ve used raspberries here but strawberries, blueberries or blackberries would also work well! Add some fresh raspberries, low carb sweetener (I used xylitol, but granular Swerve would also work well), and water to a small saucepan. Cook over a low heat until the raspberries are super soft and mushy. Push the mixture through a fine sieve. Discard the pulp and seeds. Note: You could skip the sieve stage! The result will be a darker mousse (you can see from the photos that my version is very light) but of course it will then have all the seeds, which won’t make the texture quite as smooth. Either way, set aside the raspberry mixture to cool. Sprinkle some unflavored gelatin powder into a small bowl and add some boiling water. Stir until all the gelatin has dissolved, then stir it into the raspberries. In a stand mixer, whisk some heavy cream until soft peaks form. 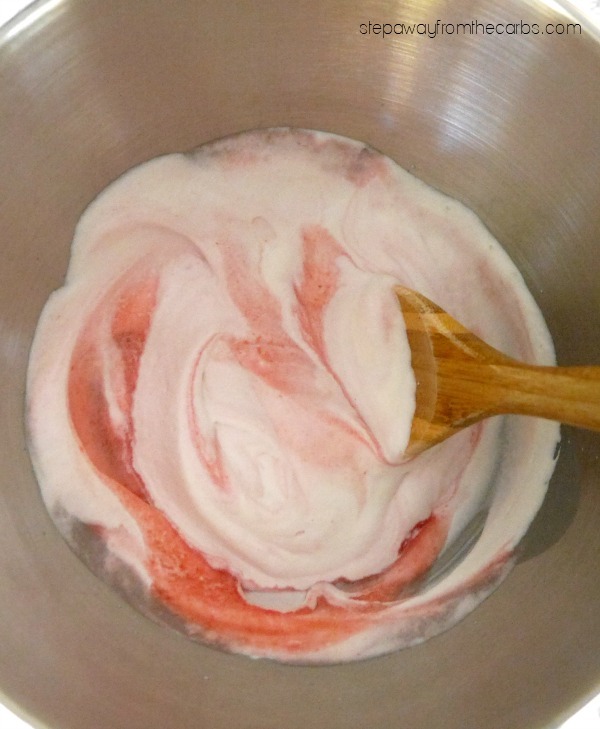 Fold the raspberry mixture into the cream. Spoon the mousse into bowls or glasses. Cover and leave in the fridge until required. When you’re ready to serve, garnish it with fresh raspberries and a sprig of mint, if you like! Add the raspberries, sweetener and cold water to a small saucepan, and heat over a low heat until the raspberries are super soft and falling apart. Push the mixture through a fine sieve and set aside to cool. Add the gelatin to a small bowl then add the boiling water. Stir until the gelatin has thoroughly dissolved, then stir it into the raspberry mixture. In a stand mixer, whisk the heavy cream until soft peaks form. 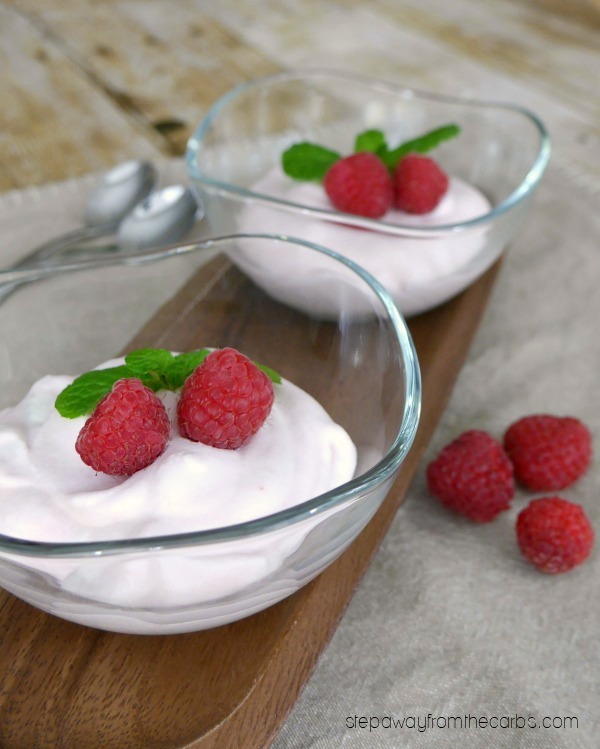 Fold the raspberry mixture into the cream, and spoon into serving bowls or glasses. Cover and leave in the fridge until required. 5g net carbs per serving (half the recipe), although actual carb count is likely to me lower as the raspberry seeds have been removed.